ConnectStats can now maintain best rolling graph over time. I find it quite interesting to see how one month compare to the other. You access the feature by going to the statistics screen and it’s the graph at the bottom of the summary page. Computing these graphs can be quite expensive. Every time you do a download, ConnectStats will process a few activities. It requires the full activity details, so only the activities for which you will have looked at the detail screen will be used. You can force to recalculate older activities by going to the settings, profiles, and select Compute Best for more old Activities. This processes quite a few existing activities. Each time to press it, it will look for activities not already processed. This is the graph showing the best Heart Rate I achieved for any given period of time. 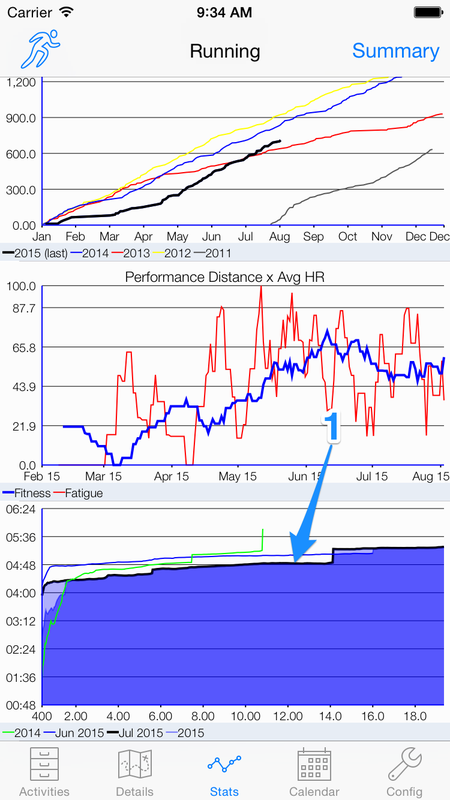 If you tap once on the graph it will rotate through the last few months, to show you how you performed then. This is the graph with the best speed or pace I achieve for a given distance. Not the heart rate is for time, not distance as I think it makes more sense. If you pan to the left on the graph it will switch to the best pace or speed. 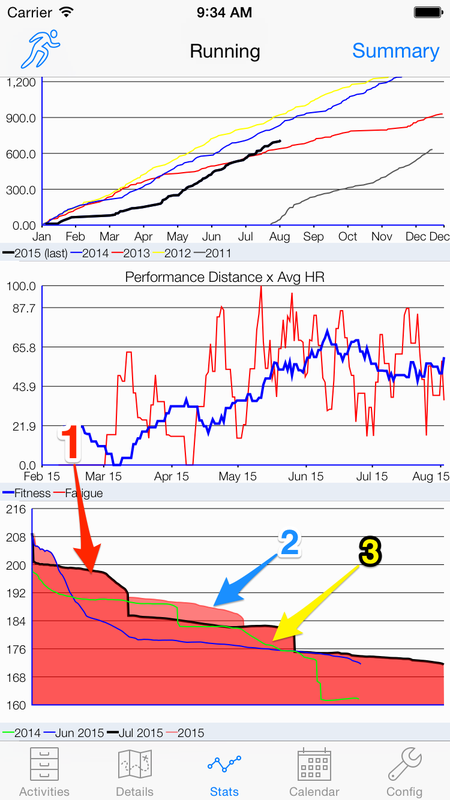 Arrow 1 here shows you that the best speed for the year on most distances was achieved in july. Note that for pace a graph lower is better, but for speed higher is better. Again, if you tap on the graph, it will rotate through the last few months. 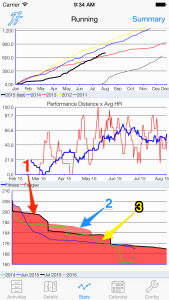 This entry was posted in ConnectStats Features and tagged ConnectStats, Statistics by Brice. Bookmark the permalink.